It is very true ! and tell everyone we will be watching at home or watching at any where there is a big High -Definition Television and huge crowd of people waving their favorite team banner. What else were important than this event that uniting us all ?? 1. Apply for MC or paid leave ! The most crucial part will be watch the LIVE of your favorite team. Nobody want to watch after-game match. 85% peoples want to know the result as soon as it come out. They want to brag and boast about it tomorrow at workplace. It even worse for those who have been doing some seasoned betting. It is wise to just bet one Milo ice or Chicken rice more than that it cant be consider. I am not encouraging you but when come to Spain vs Brazil or Germany vs England who will sleep soundly during LIVE action? Aim your date for MC and paid leave accurately, pick your date and apply it. RTM did not have full access to every match. They did have FIFA World Cup 2014 broadcast right but they only broadcast half of the LIVE match. 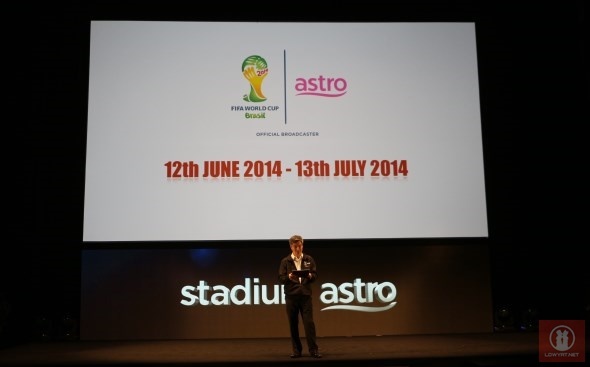 If you are a sport channel addicted person subscribe to Astro sport channel and watch it LIVE every single match . If you have not see the news. Many big companies in Malaysia is organizing contest giving away Football merchandise as a gift for your support to the brand. Such as Maggi, Jack n Jill, Nestle and many more. Not everyone can win a contest but when you do have money, you can buy merchandise inspired by Football Fever and World Cup 2014. Sport shops will sell them like hot cakes. Can you resist when your friend all are wearing some kind of support to their favorite team and you just wearing your Kpop shirts? Yes, you would need to book like going to cinema watching a movie just coming out. I think it will be much more terrible because you only can watch LIVE once. It would be a long sold out seats at every strategic placed mamak stalls at big cities. If you have not booking a round table today . It is better for you to give up the hope and go now buy yourself a HD television. Because, you will not get any chance to sit at popular restaurants cheering your favorite team. For example, Brazil vs Croatia although it not very highly competitive match it still be still in a fully booked condition. Unless you bring your own table and chair, I assured you there were a desperate situation it really occurred. In order to be at the place you like to eat the most while watching your favorite team playing with the crowd you familiar the most anything can happen. They literally do anything. that every moment you cant miss especially your favorite players are playing at the field. Keep your body hungry free because you are going to get hungry at 4 AM. You will need those energy. Instant noodle and Junk Snacks are your most preferable choice. What you do when you have full energy ?? Shout at the moment they goal !! There are many smartphone game maker out there created addictive football game. Play the game and choose your favorite country soccer team. Strike the goal with your favorite players. Make sure your opponent did not get a chance to enter your penalty area. This happened a lot. It had happened in English league and it will surely happen in this grand event. In the past there were in the extend to ending people life. Support your favorite team and it is not necessary telling people to support your favorite team because everyone is not the same. It is like the title suggests " Uniting us all but not everyone support the same team" If you like Brazil who won 5 times previously then do not anger the group of people who supporting their favorite team England. Control your emotion do no be so stress ! Let it go , let it go cant hold it back anymore ! Most of us are sleeping at 4AM. Research study concluded that human are the weakest at the time 4AM-5AM. The only way for you to watch your match will be drink coffee or nescafe. There is no guarantee you will survive till the end of the match. Besides, first match will be on Malaysian time Friday before sunrise at 4AM. I guess in the middle of the game, Muslim will go on praying. Set your clock now at this coming Friday 3.50AM , 10 minutes earlier for the time being to open up television !! It not like my favorite team England or your favorite team Brazil won the last FIFA World Cup 2010. You have Joyful laugh if your favorite team was either Spain or Netherland , most of us " tearful eyes " because our most unexpected thing become reality.